Ahem….I’m ashamed, yes. But life is life and sometimes things aren’t ALWAYS in order. For my family, I could never seem to get a handle on a place to organize important things….like homework, important school papers, KEYS!! !, library books, and the list goes on and on. I also never had a place to centralize other important life things like our monthly memory verse, the weekly menu and the gazillion appts, meetings, school functions, parties, etc that the FAB 5 partake in. So, one day, I decided I was done with the above picture. I’d had enough. (No hard feelings, little countertop. But let’s be real- what purpose can you really serve as a teeny-tiny counter that fits NOTHING!) Ok, I’m digressing now. This led me to Pinterest. (Insert me singing, “These are a few of my favorite things!! !”) I adore Pinterest. A-d-o-r-e. I began to search and search for a daily system that could organize our lives. Hefty duty task right there. Well, the more and more I searched, all I could find was store bought stuff. Specifically from Pottery Barn. And it would cost be a month’s worth of groceries just to place the order. Ahem, no thank you. 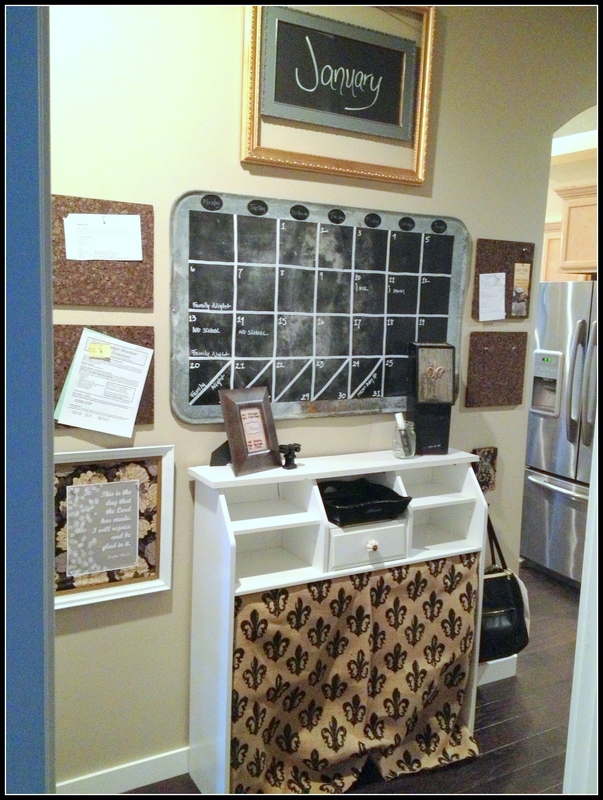 So my brain wheels started spinning and I began the search for an “Audra Style” daily system. For those of you who are new to this blog, first of all, WELCOME! And second of all, Audra-Style is basically this: “doing projects with as little money as I can without hurting oneself or breaking the law and staying true to my style”. WHEW! There it is folks. Design at its best. My journey began around my house. Here’s how it went: First, I walked around to see what I already had. What could I repurpose? What did I have hiding in a closet? Second, I checked the FREE section on Craigslist. Seriously, aside from my husband, kids and Jesus, Craigslist is the next important relationship to this girl. I have scored so many amazing things just from that FREE section- but that’s another post. And lastly, I headed over to the Goodwill and to Hobby Lobby’s clearance section to see if there was anything I could use. 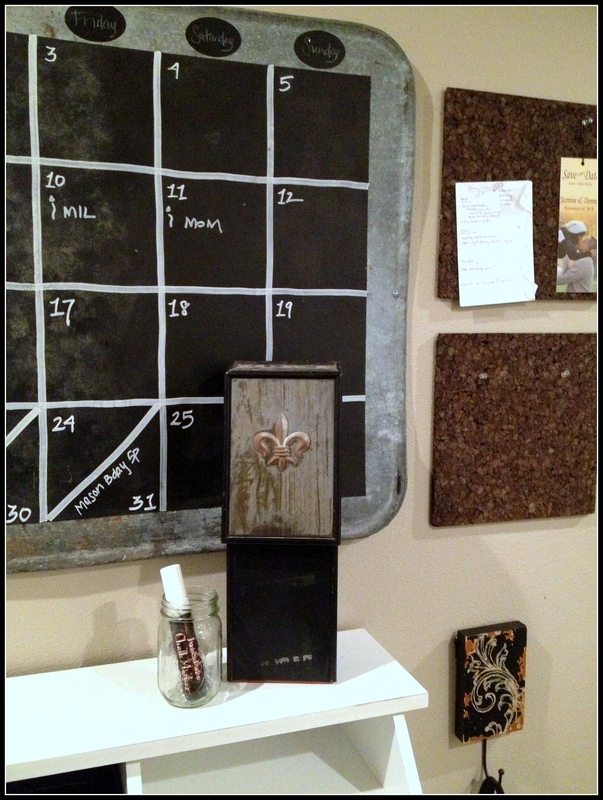 I started with a monthly calendar. 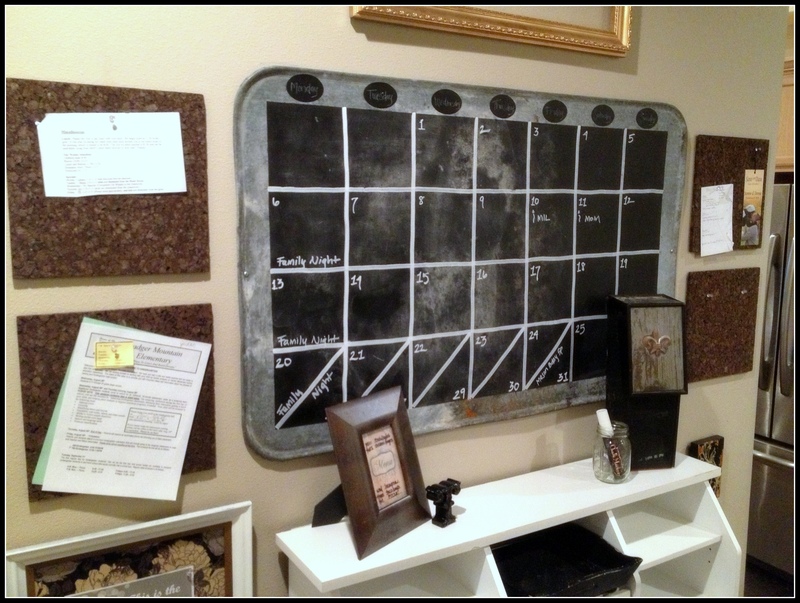 I already had an old oil pan chalkboard, so that was a big savior. I just bought a chalk pen for $3 and created a calendar on it that I can wipe off every month. 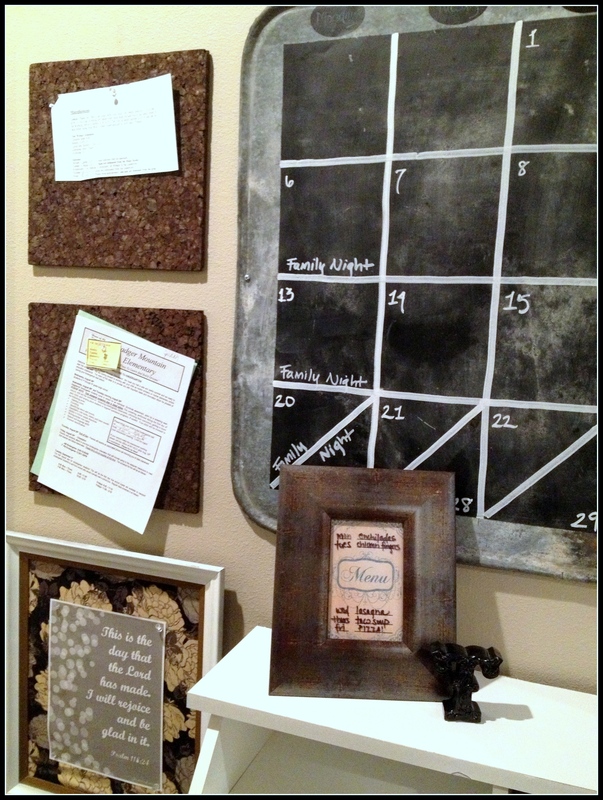 I also bought a couple of cork boards at Hobby Lobby for $3 to pin important papers on. 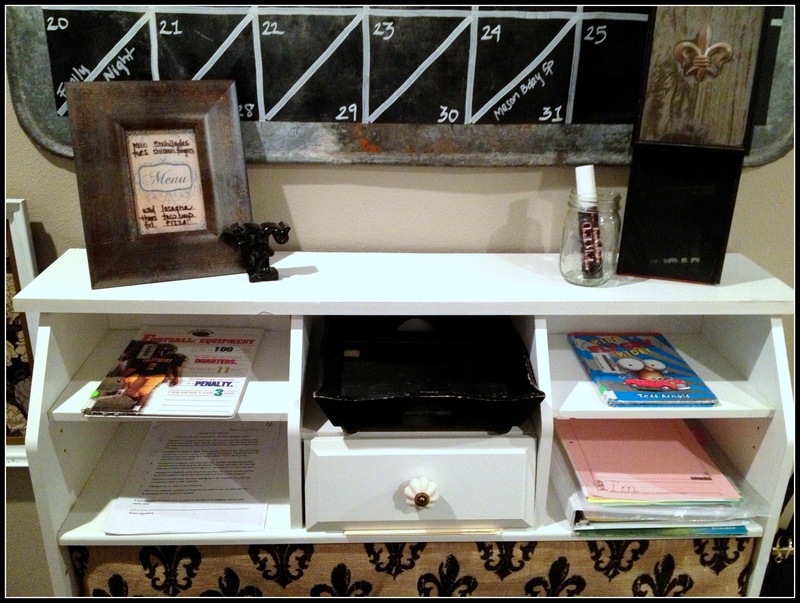 Next I needed a central place to keep homework and keys. I SCORED this white piece for free off of Craigslist! Yes, on Friday nights at 10pm, you can find me in the depths of Kennewick hoisting furniture into my car. Don’t judge. It’s perfect, really. In great shape- and it couldn’t be too big or it would stick out too far in my hallway. I added a knob that I already had and made a skirt from fabric that was 50% off at Hobby Lobby (total fabric was $5). You can see that the shelves are perfect for library books, homework and a shelf for keys too. A match made in heaven. 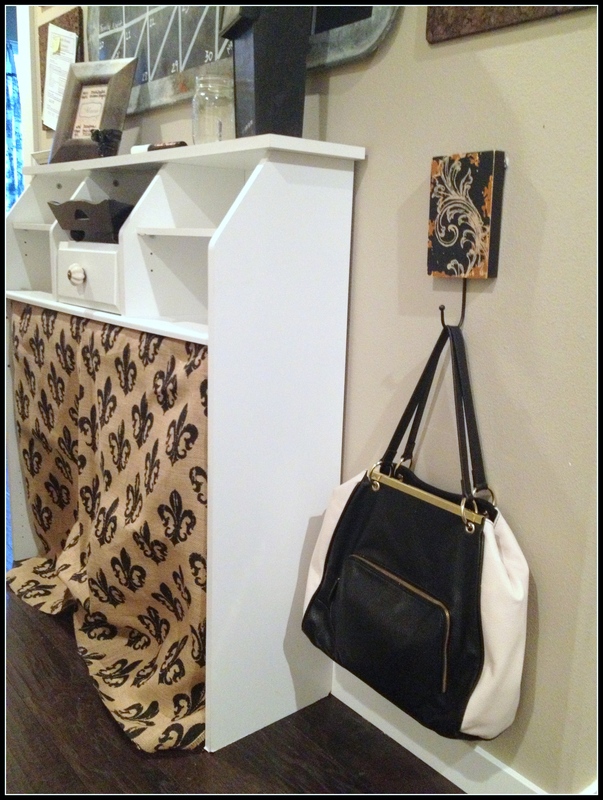 Next, I needed a place to hang my purse. I know, weird right? 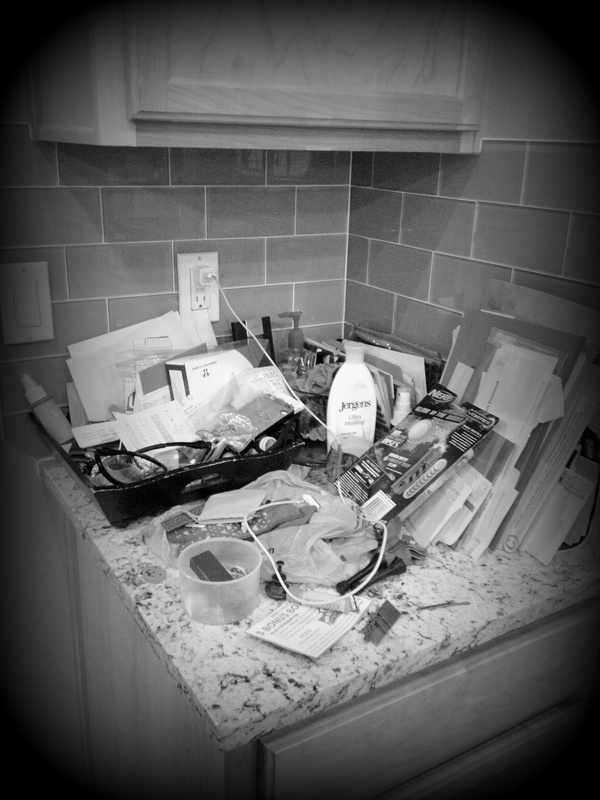 My purse would always just sit on a counter in the kitchen and it always bugged me. So I bought a little hook at HL for $3. On the other side is a frame that holds our monthly memory verse. It’s just a frame that I had and I added a fabric square to it. 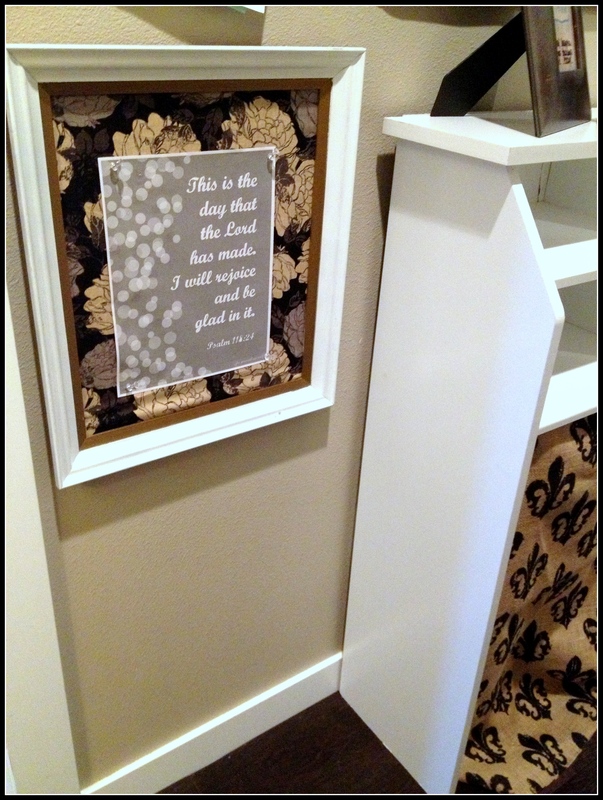 So I just pin the scriptures on it and I like that it’s at kid height. Sitting on top of the shelf-thing is a mailbox. I’ve always wanted a place where we can all “send mail” to each other and bless, encourage, ask important questions, etc. My boys have already used it and they love it. I found the mailbox at the Goodwill for $2.99. On the other side is our menu for the week. I already had the frame and printed a blank menu from the internet. I use a vis-a-vis pen to write on the glass. What sorts of ways are you bringing organization to your lives? You know, a design project is never really finished, so I would love to steal hear what you’ve got working for you! You are Amazing Proverbs 31 kinda gal! Oh thank you, dear Cindy!